Your iPad's serial number can be useful if you want to check your iPad's warranty or AppleCare+, but unlike some devices, it's not printed on a sticker stuck to the back of the device. The serial number can also be used to see if an iPad has been lost or stolen. Apple has created a website for checking the activation lock status of a device via the serial number, which makes this a great way of checking that used iPad before you buy it. First, you will need to go into the iPad's settings. You can accomplish this by clicking on the Settings app. Next, scroll down the left-side menu and tap on General. In the General settings, tap on About. This is the first option available. 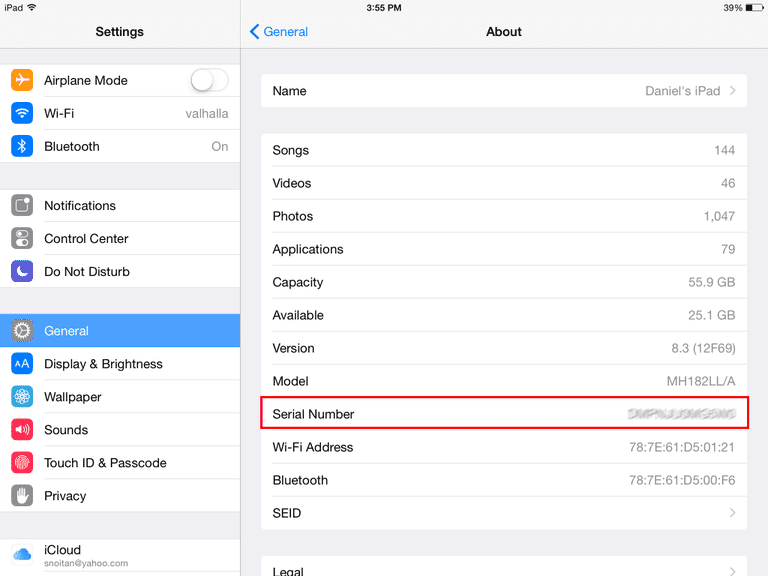 The serial number is located towards the bottom of the information listed on your iPad. What else can you find out about your iPad? The About section of settings contains a few pieces of information that you may find useful. There are many different types of iPad: iPad Air, iPad Air 2, iPad Mini, etc. If you are uncertain of your iPad's model, you can use the alphanumeric model to find out which iPad you own. You can also check the iPad's total and available storage from the About screen, along with interesting facts like how many songs, videos, photos, and applications you have loaded on it. You can even give your iPad a new name by tapping the iPad's device name from the About settings.